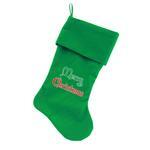 This beautiful Merry Christmas Velvet Dog Stocking will bring all your dogs holiday wishes alive. Great for gift giving or for including pets in on the holiday celebrations, this stocking features a screen-print on the front and classic holiday styling. Made of velvet.